Maria Costello MBE returns to the Isle of Man this week, looking for a repeat of last year’s podium finish in the Bennetts Senior Classic TT. The Northamptonshire racer made history at the 2016 event when she became the only female racer ever to earn a place on the Classic TT podium alongside John McGuinness. Her strong form - crowned by two podium finishes in the Cup 600 class of the British Sidecar Championship at Thruxton and a new PB lap time and top 10 finish in the Supertwin class at the Ulster Grand Prix - puts her in good stead for the challenge of the 37.73-mile TT course she’ll face onboard the Beugger Racing Paton. Maria rounds Quarter Bridge on maiden practice lap. “I’ve had an incredible season so far and it would be great to replicate the podium finish I achieved here last year. I’m very aware that, as ever, it won’t be an easy task, but my attitude remains the same; to enjoy riding the beautifully prepared Paton owned by the wonderful Peter and Barbara Beugger. Maria has already completed one lap during Saturday’s practice session and is looking forward to more when it resumes on Wednesday evening. 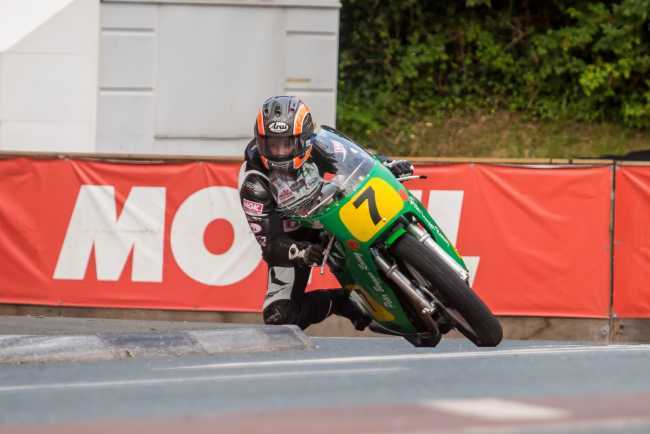 The Bennetts Classic TT runs from 19th August to 28th August.